Posts from a commander in Elite Dangerous. You can find me on Discord as Siobhan#9063, or in game as Cmdr Shivvi. All flights are suspended due to network instability. Flight test will be initiated tomorrow morning. After about four and a half years of service, today saw the retirement of Cmdr Shivvi&apos;s command chair. It saw me through 4 House moves and many hours of flight. Burial will take place tomorrow at Bluntisham Recycling Centre. It could no longer support my weight and the covering was peeling all over. The arms, flat and hard. The replacement was placed this evening, with mountings for the hotas and USB hub 3d printed by @geekylou. Initial tests make it comfy if more snug than before. A while ago, I bought and started fitting a Beluga liner. Since then I went off on a trip round the galaxy. In any case, I&apos;m back, I finished configuring the ship, painted it black andd have finally named it SVP-XL "The Other 99 Percent". Now about 24LY from the bubble. Made some progress today after a slow, somewhat sick weekend. Well past ⅓ of the way home. May reach ½ way tonight. We&apos;ll see. So I won&apos;t be flying this morning due to a pain behind my left eye that&apos;s been there since yesterday evening. If I push it, it could become a full on migraine and I don&apos;t really want that right now. Taking the dearest direct line, and mapping we get a star catalogued as Byoo Briae CW-C C26-0, which is about 22,000 or so LY from my present position. I am headed there next therefore to start the trip. The next major section of my journey will be to follow the journey of the USS Voyager (Star Trek). 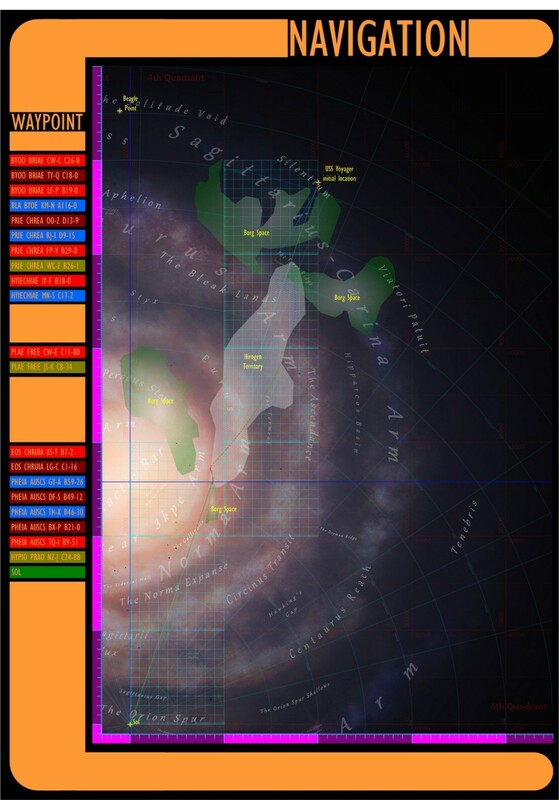 Thankfully, a lot of the groundwork has been already completed by others, so mapping Trek&apos;s fictional stars onto the Elite Galaxy won&apos;t be such a chore. A major problem being that Trek&apos;s estimate of the size of the Milky Way is slightly larger than the one used here. Both claim to be accurate. I am now 65,279.35 Light Years from home. Leaving the beacon, at 11:48GST, I made planetfall at Beagle Point II, "Darwin&apos;s Legacy" within a half kilometre of the original landing point.